Discussion in 'Vintage' started by zoomer, Jan 1, 2011. I recently found the old Poughkeepsie, NY, Eagle-News online here. Poughkeepsie was the home of Werber Leather Coat Co. from about 1923-29, when they relocated to Beacon, a smaller town about 15 mi down the Hudson River. I'm in the early stages just yet, but have learned that Werber Coat (owned by Max Werber and his partner Louis Kramer) was a very troubled company during the depression days when they built government contract clothing, including A-2s and B-1/B-2 flight suits. Fire was a constant hazard in leather shops. Max Werber had equipped the Beacon plant with sprinklers, but the water ruined garments and/or hides. (The latter were supplied to Werber by the government, something I wasn't aware of.) A small fire in 1933 was followed by a major one in 1934, which caused Werber to file for $20,000 in insurance claims. Fire inspectors discovered signs suggesting arson. Altho this could not be proven, the insurers balked at paying. Werber took them to court, lost the decision, appealed and won, then lost again. Litigation continued into 1938, about as far as I've researched. $20,000 was a huge loss then, amounting to about $300,000 in today's USD. The National Recovery Act of 1933 was a New Deal program that set wage and hour codes for a wide variety of jobs. (The Supreme Court later found it unconstitutional.) Employers who did not meet the codes faced federal sanctions as well as strikes. In 1935, about a third of Werber's 90 workers walked out over piecework rates. Students from Vassar College joined the pickets. The strike, however, was unsuccessful despite state and federal negotiators intervening. Something interesting emerged from the strike news: Werber had a government contract for black leather coats. I wonder who was issued them? Working with the black leather created a health hazard, as they gave off a sooty dust which sickened some workers. 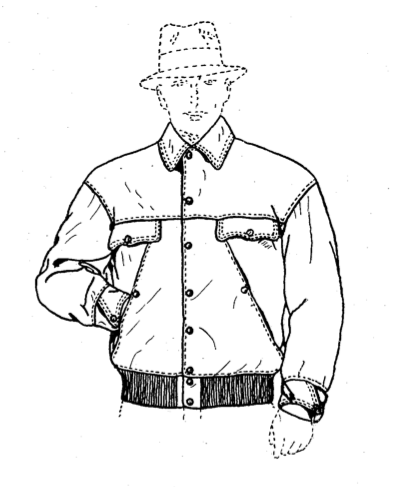 Max Werber took out a US patent for at least one coat design, a 1929 jacket with slanting hand pockets. I'm trying to find it again and will post the drawing when I do. Finally, all references I've found up to 1938 refer to Werber Leather Coat Co. of Beacon. As you may know, Werber moved to nearby Newburgh and reorganized as Werber Sportswear - the name on their 1939 and 1942 A-2 labels. This had to happen sometime after losing the insurance case, and I would think, very probably because of that case. Micawber and Geeboo like this. the 39 Werber is my all time fav A-2 contract! Interesting research, Paul ... more would be great. Fascinating! Looking forward to more from your research. Terrific stuff! Thanks for the great information, Zoomer. I love Werber jackets so it's great learning some history on them. The Werber Leather Coat co moved into a building formerly occupied by Poughkeepsie Plants co at 19 Academy Street, Poughkeepsie in Feb 1923. It is unclear from the article in the paper whether this was the establishment of the firm or its relocation. Whatever the case it pre-dated Aero by over a decade! I drove through Beacon on my way up to Maine a year or two ago; it's a charming little town, well worth visiting. I knew about the flight jacket connection, of course, but didn't have time to track down where they were made. So the information does not get lost. Here are the key documents from the Poughkeepsie Eagle. This article shows that around 22nd Feb 1923 Werber set up a factory in Academy Street. They were keen to recruit additional workers in Jan 1924 as the buisiness expanded. By August 1929 the firm was keen to expand further. Max Werber is cited as the head of Werber. Wonder if John Chapman or Mark Fisher know about that Union Special machine. It was still in use in 1934. This ad appeared in Help Wanted–Female, Oct. 9. 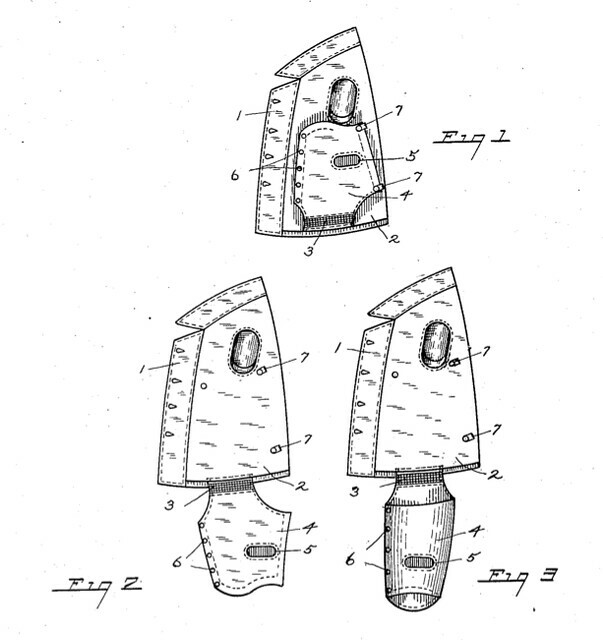 Here are illo cuts of the 2 patents granted Max Werber for clothing design. A 3/4 coat with built-in leggings, for drivers who could not use lap robes in cold weather. The leggings attached to the coat's inside by elastic material, so as not to pull the coat out of shape. Slant handwarmer pockets, allowing pieced front construction. Not to mention those daring dropped shoulders! Really now, Mr. Werber! I was really surprised to learn Aero Clothing & Tanning Co. of Brooklyn, NY was created by one person to fund the creation of Aero Leather Clothing Co., Inc. in Beacon, NY for others to own/operate. That would make a movie script by itself. With that in mind I followed Zoomer’s lead to see what else I could find on Werber Leather Coat Co., Inc. of Beacon, NY on Werber Sportswear Co. of Newburgh, NY. In short, not too much. Moving is really disruptive and expensive, especially if you have to find and hire new staff (given a 1935 Werber worker strike was settled by upping salary by 3 cents per hour, they’re not paying for relocation). Still, changing the name of the company is even worse since that’s the face of the company, not to mention the thousand other things to do. I found documentation of cooking the books and arson for false insurance claims, so it’s no wonder I found reference to Werber Leather Coat Co., Inc. selling all properties to pay off debts in 1936. In 1938 the insurance policy was voided due to fraudulent claims. In short, Werber Leather Coat Co., Inc. went belly-up. Werber Sportswear Co. was created because they had to: It limited any further liabilities by legally cutting all ties to the old company and they didn’t have the old company property anyway as a seed, so it had to begin back from the ground up. It’s not simply a name change and relocation; that rarely happens given the expense (tangible or not), so this makes a lot more sense. Micawber and zoomer like this. One forgets especially after 8 years. Seems as tho Max and Lou were doing business the "old fashioned way" amidst changing times when regulatory law was starting to grow teeth. The first "proper" Aero factory in Scotland was in a derelict house, no heating but there was an old open fireplace in one corner. Spitfireace, seres and Micawber like this.